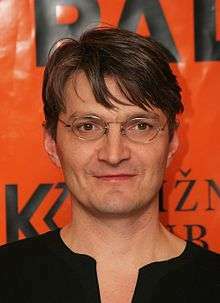 Jan Svěrák (Czech pronunciation: [ˈjan ˈsvjɛraːk]) (born 6 February 1965 in Žatec) is a Czech film director. He is the son of screenwriter and actor Zdeněk Svěrák. He studied documentary filmmaking at the Academy of Performing Arts in Prague. He and his films have received awards including the Academy Award, Crystal Globe, Golden Globe, and Tokyo Grand Prix. He currently lives in Prague. 1 2 Willoughby, Ian (3 August 2014). "New children's film by Jan Svěrák set for cinema release". Radio Prague. Retrieved 16 November 2014. ↑ "The 64th Academy Awards (1992) Nominees and Winners". oscars.org. Retrieved 15 September 2015. ↑ "The 69th Academy Awards (1997) Nominees and Winners". oscars.org. Retrieved 5 October 2015. ↑ Spáčilová, Tereza (2010-01-29). "Jan Svěrák a jeho plyšák na nás políčili v temném lese. Podívejte se" (in Czech). Mladá fronta DNES. Retrieved 30 January 2010.